LOL, cute pic, I agree Mint is addicting. I'm running it on three PC's now and love it. My biggest problem is fighting the desire to upgrade to newer versions of it. I run 18.3 XFCE on all three and there isn't any reason to upgrade until EOL is reached. Love it, and will pass it along to my other friends. Haha, I've only had it like, a week, but I'm starting to think at random "huh, I have Mint running on my laptop, I fancy a play!" I work in IT support, so usually the idea of playing with more tech in my downtime has some ulterior motive like "I gotta learn this, so I'll run it at home". But no, it's just something new, I keep coming back to it for pleasure. It's really given me perspective, it's nice just having a modern OS that does what I ask. It couldn't be more simple than that. Nothing hangs, crashes, if I want to do something, I usually can. the OS doesn't get in the way, at least. So far I have the impression it has been designed to actually help me accomplish what I need or want to! If you know how to edit the wallpaper of the live environment, you can place that inscription on it with huge bright characters, so that it's first thing the user will see when the live env starts. The comparison doesn't hold up. 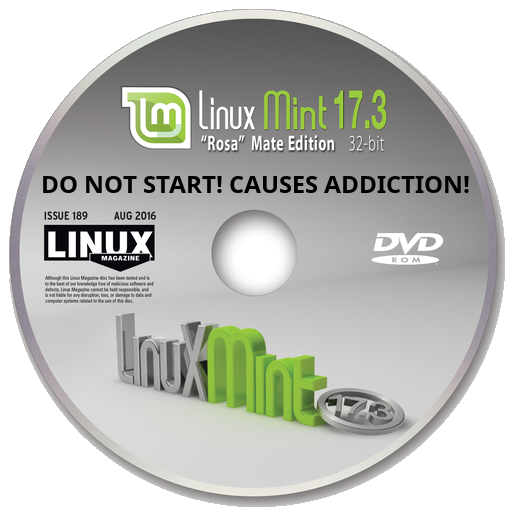 Linux Mint isn't a cause for at least a dozen types of cancer like cigarettes. Nor does it cost hundreds (if not thousands) of dollars a year to use. It's quite the opposite. Linux Mint is more like quitting smoking. Clearly you don't get the joke (sort of). Once you start using it, you always keep coming back to it - just like any cigarette addict would do brand hopping but eventually would return to their favorite brand of cigarettes. Besides, the joke wasn't intended to insult Mint. Quite the opposite, actually. It was meant to say Mint is so good that you can get addicted to it. I think most of us got it for what you intended - I guess X is making the analogy quitting Windows and going over to linux maybe like quitting smoking which is clever as well. Anyway I agree with your sentiment, I have been away from Windows for so long that when friends and family ask for my help on their Windows PC I have to decline, not because I don't want to help, rather because I am helplessly lost on a Windows system. When I quit smoking I was a nervous wreck ready to kill anything in my path. I am afraid I will have to disagree with you on this one. More like a cold beer on a hot afternoon or a really fine wine after your favorite meal. Mint is indeed addictive. It's such a pleasure to use, probably more so having spent years fighting Windows trying to get it to do what I wanted it to. Mint just works!